Are you interested in converting from a septic system to city sewer in your area? You’ll have to first determine whether your neighborhood has city sewer. Check with your neighbors to find out if they are on city sewer or contact your local Public Works department for this information. If sewer is available we will need to know if sewer pipe has already been added onto your property or if we need to do a tap into the main line; we can provide the service either way. We will get the necessary permits for you and hire a licensed plumber to do any work inside the house if the plumbing needs to be re-routed. 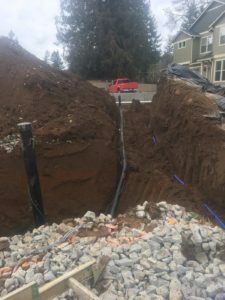 Digging a trench for the sewer line through the yard can damage it and we try to minimize the damage as much as possible. We take extra special care to protect your prized lawn, trees, and shrubbery. Once the permits are received and applicable city fees are paid, you’ll need a licensed contractor to complete the project. Seppanen Construction, LLC is licensed to convert old septic systems to public sewer and can help you through this process. We will connect the house to the city sewer system, and then properly pump, collapse and abandon the tank. For more information about septic to sewer conversions, check out Vancouver’s Sewer Connection Incentive Program. If you have a septic system but would like to convert to city sewer, please don’t hesitate to call us at (360) 263-7950 and schedule an appointment now, or contact us for more information.